Keno Cup 2010 - Review & play for Keno action NOW! Step 1 – Select the stake you would like to make in this instant game, between 10p and £150. Step 2 – Select 15 numbers from the football pitch, they are numbered between 1 and 80. Can't decide what numbers to pick? Then you can also choose to auto pick your numbers by using the buttons on the bottom left hand corner of the Keno Cup 2010 instant game. This allows you to pick between 5 and 15 numbers at once; therefore, you could auto pick a selection of the numbers such as 8 and handpick the other 7 numbers yourself. Step 3 – Double check that you are happy with your stake and click on ‘Submit'. The instant game will now be playing and you will want to try and match as many of your 15 numbers to the 20 balls that will be called out. The more balls you manage to match the larger the cash prize you will walk away with. Step 4 – Once 20 balls have been called the instant game of Keno Cup 2010 would have finished. If you have won a prize it will be revealed to you inside a football net. Keno Cup 2010 is a football themed Keno instant game that rewards their players for successfully predicting the numbers that will be called out during the course of the game. 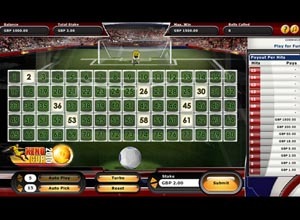 The Keno Cup 2010 game is well designed and features a football pitch complete with a goal and moving goalkeeper. An unusual aspect of this instant game is that the ball numbers appear inside a football at the bottom of the game, this football is then kicked towards the number to daub it off, this stays true to the theme of the game. However, if you decide to speed up the game by clicking on ‘Turbo' then the ball stays where it is. The cash prizes up for grabs are also impressive; if you manage to match all fifteen numbers you will win the Keno Cup 2010 game jackpot and walk away with between £2,000 and £100,000. Now the reason the jackpot fluctuates so much is because it depends on how much money you have decided to stake on the instant game. Simply check out the Payout Table on the right hand side of the instant game and you will notice that it changes when you select a different stake amount. So what are you waiting for? Let's see if you can score a goal and walk away with a cash prize. Keno is another popular Keno game you can play for free on Lord Bingo.